In an Unnata Aerial Yoga class we use a slow progression of postures and movements to gently introduce your body to the hammock. Through this slow progression, your body and mind both are prepared to fully release and enjoy the benefits of hanging once you get there. In the mini-class video below, I demonstrate what could be the first 15 minutes to an Unnata Aerial Yoga class – before we would get to hanging upside-down. Although the video does not show a complete class, it is shot in real-time, (one long take) so you can get a sense of how classes truly flow. 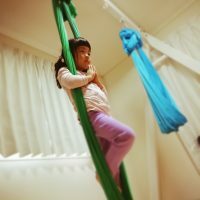 This way, you get a chance to see what types of postures we actually do in Unnata Aerial Yoga classes as well as how long we hold positions and some of the reasons why we do what we do. Thank you so much for the viedeo. I am new to aerialyoga and it has amazed me. Fantastico trabajo!